When I started Jamie's Phuket Blog in 2006, part of the idea was to show that Phuket is more that you might realise. More than I realised too. And it took me years to figure this out! I was often reading comments like "Phuket is crowded and too touristy and has no local life" on travel forums.... and it became clear that the people writing these comments had not left the main beaches or had booked onto the cheapest possible tours with 50 other people in 1 longtail boat to James Bond Island... I started the blog to show that Phuket has much more to offer than just beaches, bars, cheap fake handbags.. I mean why travel so far just for that? If you are from Europe you can get a beach and sun in Spain or Greece. If you're coming to Thailand, come on - try to see the real Thailand! If you flick through the pages on this blog you'll find a huge mixture of things to do, some more touristy than others. Phuket does have some very good tourist attractions like Phuket Fantasea or Splash Jungle Waterpark or the ever popular Aquarium, but many of the places we like to visit are off the beaten track, or maybe we like to visit popular places but we do it "our way" rather than with a tour. And with that in mind... Easy Day Thailand is a tour company set up in 2010 by friends of ours. Ingo and Diego can book you for any tour you want, but the real attraction is that they can do personalised tours, some of which are based on this blog - for example, if you want a trip in Phang Nga Bay, including James Bond Island and Panyee Village - Easy Day Thailand will do it "our way", avoiding the tourist crowds and with lunch at a local seafood restaurant. If you want a rent a villa, charter a speedboat, go elephant trekking, then these guys can arrange it. Tickets for Fantasea or the new Siam Niramit show, airport transfers, Thai cooking classes, day trips to Phi Phi Island, snorkeling trips. Pretty much anything really! If you want to go scuba diving, then you can contact me directly - I am manager at Sunrise Divers based at Karon Beach - ready to help if you want to try diving for the first time, or if you are already a diver and want to experience the best diving in the area - find me at Sunrise Divers! 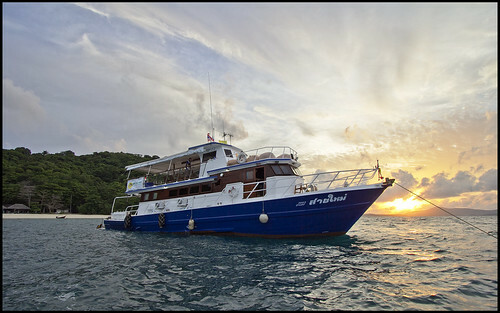 (above) Tour boat at Coral Island - ask Easy Day Thailand for sunset tours or boat charters. One of the most popular trips sold by Easy Day Thailand is a very nice day trip over to Racha Yai island (aka Raya Island), about 15km south of Phuket. You can go snorkeling, explore the island and there's a lunch at Ban Raya resort. You can also stay on the island at Ban Raya - we did this 2 day trip in September 2012 - see Weekend at Racha Yai. I'd dived at Racha maybe 100 times and never before set foot on the island. You see, there's always more to explore! (above) - Racha Yai (Raya) island - great for a day or overnight trip. New! Added in 2012, Easy Day Thailand now have Khao Sok tours - the Khao Sok National Park is north of Phuket, about a 3 hour drive, day trips are possible, but it's better to stay a night or two, enjoy nature, water activities, elephant rides, fantastic scenery... read more : Fun and Relaxation at Khao Sok National Park. The guys at Easy Day Thailand are very flexible - if you want to arrange a personalised day trip around the Phuket area, they can help. If you are a regular reader of Jamie's Phuket, and have seen something on the blog that you'd like to do, just contact Easy Day - let them know what you want to see... something can almost certainly be arranged. If you are a fan of temples, or want to take in some of the best views in Phuket, contact Easy Day Thailand - almost anything is within reason, ask for Ingo or Diego - they'll be able to help!